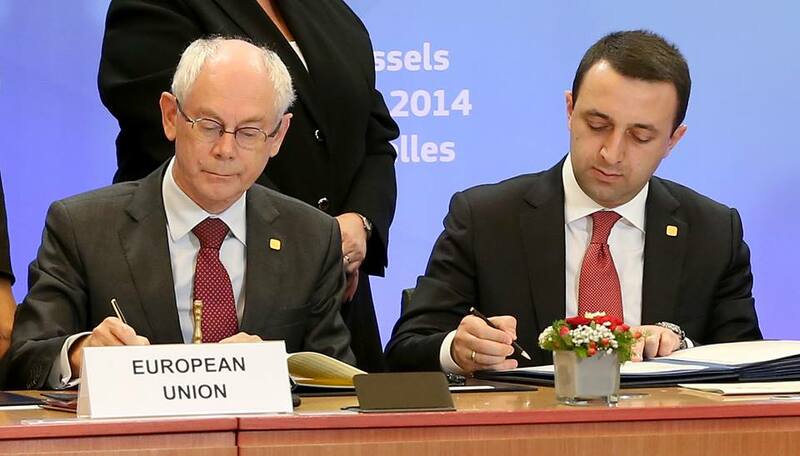 Today, Georgia and the European Union signed an Association Agreement at a European Council meeting in Brussels. Georgian Prime Minister Irakli Garibashvili and Herman Van Rompuy President of the European Council sign the Association Agreement. The agreement, which is designed for gradual approximation to EU standards and regulations in a broad range of areas including trade, customs procedures and quality controls, does not give a pledge to eventual membership in the EU; but the reforms and approximation process, envisaged by the agreement, are viewed as preparation for potential membership sometime in the future. According to EU estimations, Georgian agricultural products will become more attractive on the EU market after the removal of EU import duties worth EUR 6.3 million. Photos courtesy of the Government of Georgia. I’m glad about this. It’ll be good for everyone. I love Georgia.